“Robbie Summers, a fellow guild member and mentor, also encouraged me—and many others. All the guild members have been supportive in the 10 years I’ve been a member,” she reflected. Long says color is often the driving force in the work she’s creating today. She explained that she generally works with a pretty standard palette—heavy on the red to yellow quadrant, supplemented with complementary and contrasting hues and accented with black. “I keep a color wheel out all the time. I’m constantly referring to it as I work on a piece,” she said. “The best boost for my productivity was moving my painting area into a corner of my family room. It encourages me to paint often,” Long said. “I have to be inspired to paint. I can’t force it. The beautiful surroundings outside my windows help provide that inspiration,” she smiled. “Today, I am an artist,” Long reflected. 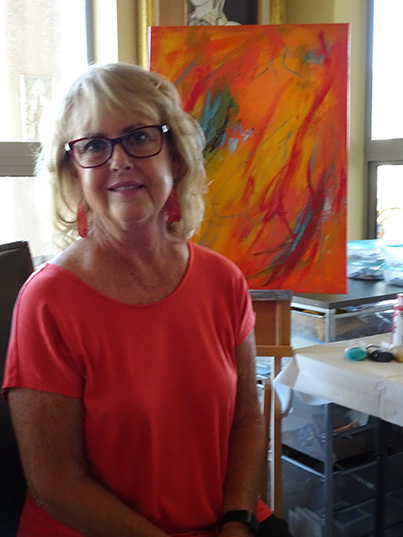 You can find her work in the SaddleBrooke galleries and at Abstract Art in Catalina.